Prescriptive Analytics – What’s a manager to do? Prescriptive analytics differs from descriptive and predictive analytics in that prescriptive models yield a course of action to follow. That is, the output from a prescriptive model is a plan for management to follow. Applications in business including production planning, location analysis, supply chain design, transportation, marketing/product design and financial portfolio analysis will be discussed. This module will include hands-on experience using open-source software (Open Solver) in Microsoft Excel, R for Optimization, and AMPL – algebraic modeling system. In this one-day program, we will discuss prescriptive analytics including rule-based systems, heuristics and optimization, with an emphasis on optimization modeling of real business problems. Improve your ability to view business processes and relationships systematically and analytically. Business Applications of Linear Models with Open Solver, R for Optimization, and AMPL – algebraic modeling system. This program is designed for analysts who want to learn more about predictive, descriptive, and prescriptive analytics and how making decisions with data can be enhanced through optimization models. This module is highly relevant for anyone seeking advanced knowledge in optimization modeling. This course assumes prior knowledge of algebraic notation and Excel. What makes decision making difficult? 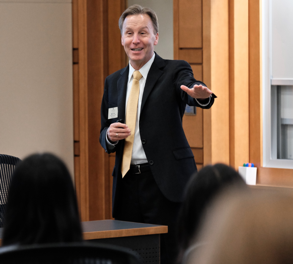 Jeffrey Camm is Associate Dean of Business Analytics and the Inmar Presidential Chair in Business Analytics at the Wake Forest University School of Business. His scholarship is on the application of optimization modeling to difficult decision problems in a diverse set of application areas including, operations planning and scheduling, supply chain optimization, product design, and conservation. His research has been featured in Business Week/Financial Times-ranked academic journals such as Management Science and Operations Research as well the renowned journal Science. He is coauthor of seven texts on business statistics, management science, and business analytics. Jeff received his PhD in Management Science from Clemson University and a BS in Mathematics from Xavier University. He previously held the Joseph S. Stern Chair in Business Analytics in the Lindner College of Business at the University of Cincinnati, where he served as department head for twenty years, was awarded the life-time appointment as a Fellow of the Graduate School, and was the founding director of the UC Center for Business Analytics. He has also held positions of visiting professor of business administration at the Tuck school of Business at Dartmouth College and visiting scholar at Stanford University. He has consulted for numerous corporations including Procter and Gamble, Owens Corning, GE, Tyco, Ace Hardware, Boar’s Head, Brooks Running Shoes and Kroger among others. His work with Procter & Gamble is credited with saving P&G over $250M in their North American supply chain and was a finalist for the prestigious Edelman Award. Program begins promptly at 8:30 and will wrap-up no later than 5:00. The cost of the program is $825 and includes materials, continental breakfast and lunch, and is due in full at time of registration. Additionally, Wake Forest University alumni and faculty receive a 25% tuition discount. Please contact Holly Stearn, stearnsh@wfu.edu, for more details. Prospective participants who withdraw at least 15 days prior to the start of a course will receive a full refund of tuition paid. For more information or to speak with a program adviser, please send an email to Holly Stearn at stearnsh@wfu.edu or call 336-758-4258.